Analysis: Unprecedented meeting between Israeli students and PA President reveals an awkward aversion to inconvenient truths. More than 300 Israeli university students and dozens of journalists crowded the Palestinian Authority's Ramallah headquarters Sunday, for a unique event advocating a "Two-State Solution". In a packed room at the Muqata compound, PA President Mahmoud Abbas outlined his opinion, his complaints and his demands concerning the ongoing negotiations between the PA and Israel. The event was co-organized by the One Voice association and Labor MK Hilik Bar, who heads the Knesset Caucus for the Promotion of a Two-State Solution for the Israeli-Arab Conflict. Interestingly, more than one participant explained to me that they did not "trust" the Palestinians, but were motivated to push for vast territorial concessions because they saw no other option. None could explain how a lasting peace could be made with a partner you do not trust; and this strange desperation to believe was to underline much of the subsequent proceedings. Parts of Abbas' speech were unremarkable: he began by berating the Israeli government for what he said was an insincere stance in negotiations, and reiterated his position for a Palestinian Arab state in Judea and Samaria along the pre-1967 armistice lines. He also outlined what he said were major concessions made by the Palestinian Authority, including acceptance of the idea of minor land swaps to take into account major Jewish "settlement blocs", and his suggestion for a NATO peacekeeping presence in Judea-Samaria. He also assured his audience that he was not looking to "dump" five million Arab refugees and their descendants on Israel, but emphasized that the "refugee question" needed to be solved one way or the other. But the speech was anything but bland. Buoyed by the sympathetic, largely left-wing audience, Abbas exhibited a rhetorical deftness for which he is less well-known than his Israeli counterpart and nemesis, Prime Minister Binyamin Netanyahu - but unjustifiably so. For artfully woven in between the diplomatic platitudes was some breathtaking double-talk, historic revisionism and sugar-coated incitement - executed with a charm that was almost endearing. Nowhere to be found was the firebrand who only two months ago lionized released murderers, and who has named the pro-Nazi former mufti of Jerusalem as a "hero" who should be emulated. In his friendly, almost grandfatherly tone the Ra'is (President), as he is known, admitted that incitement was a problem within the Palestinian Authority - a significant admission, though one which will come as little surprise to those familiar with the glorification of terrorism and rampant anti-Semitism within official PA media and often expressed by senior officials. And yet, instead of taking responsibility he insisted that he and his Authority were not to blame. Despite the incitement coming from his own camp, the guilty party was none other than Israel, he claimed, since he was still waiting for a response to a 14-year-old proposal for a tripartite committee (of Israel, the PA and the US) to "referee" the issue. No one batted an eyelid. And when Abbas took the Israeli media (and to an extent the international media - which, he informed the Israeli delegation, "you" essentially control) to task for "propaganda" against him, there was more applause. He was indeed correct that those who accuse him of denying the Holocaust in his Ph.D thesis had clearly never read it. If they had, they would see that he paraphrases the Koranic verses about the value of human life. More applause. And if they had, they would also see that it is entitled "The Other Side: the Secret Relationship Between Nazism and Zionism", and that it claims that "a partnership was established between Hitler's Nazis and the leadership of the Zionist movement ...[the Zionists gave] permission to every racist in the world, led by Hitler and the Nazis, to treat Jews as they wish, so long as it guarantees immigration to Palestine." They would also see that, whilst not denying the Holocaust itself, Abbas does deny the scale, asserting that "…it is possible that the number of Jewish victims reached six million, but at the same time it is possible that the figure is much smaller - below one million," and that the figure of six million was simply invented by "the Zionists". But, alas, they had not read it. And even if they had, it was abundantly clear that Hilik Bar and co. would never have allowed it to wreck the party. For when, during the Q&A session, one of the carefully-vetted questioners asked how Abbas could assure that an influx of "refugees" - in whatever context - would not tear the demographic fabric of the Jewish state, the veteran diplomat simply grinned and offered a revealing tongue-in-cheek response: "What, do you want to impose birth control on us?" Hilik Bar shifted uncomfortably in his seat, cleared his throat, mumbled something about it not exactly answering the question... and urged proceedings along. I could barely stifle a chuckle. And apart from spotting something remarkably interesting on his desk, Bar did not react when Mahmoud Abbas - whose term as "Palestinian President" terminated five years ago and counting - informed us that we should not worry about the influence of extremist groups because "we are a democracy here. We have transparent elections." Far less humorous, however, were Abbas's comments about "the settlers". "You are honorable people, it is a shame what the settlers' do without any reason. The cut our trees, they kill, they destroy... they slaughter my sheep," Abbas goaded. "You must stop them." Nobody asked him when and where all of these mysterious "settler" murders occurred. But nearly everyone clapped. It was a master class in incitement and manipulation, to an audience which he and other speakers had repeatedly assured were the next generation of Israeli leaders. Of course, if Israel had agreed to take part in a tripartite committee such incitement would likely never have been uttered. Nor would it appear regularly on PA TV as a license to violently attack Jewish villagers in Judea-Samaria. And whether claiming that Jerusalem "has always been Palestinian", or denying the Jewish connection to the Temple Mount (we should be happy with the "Wailing Wall"), or informing us that Hamas had "renounced extremism", it was clear that nothing would ruffle the feathers of those assembled. 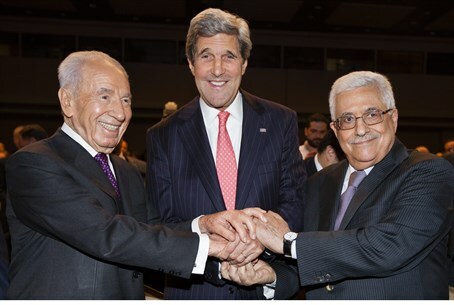 Nothing would shake their belief in the "Two-State Solution" with the moderate speaker before them. Given that these are the architects of the "Two-State" template upon which the current negotiations for the future of this country are based, that is something which should worry us all.